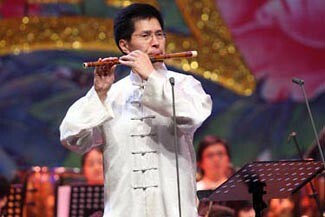 Dizi player Zhang Weiliang was born in Suzhou in 1957 and began to learn Dizi from famous Dizi player Zhao Songting in 1967. In 1977, he entered the Central Conservatory of Music, then transferred to Chinese Instruments Department at China Conservatory of Music in 1981 and served as a teacher there when he graduated in 1982. Widely known as the “king of Dizi,” Zhang has published multiple solo music CDs. As a solo performer, Zhang has got many performance and composition awards in China and overseas. He was also in charge of the solo performance for moives “Ju Dou”, “Raise the Red Lantern”, “Five Women and One Rope” and ” Farewell My Concubine”, which got movie music awards at some international film festivals. He expanded the range of Dizi to three octaves by applying gamut, twelve-tone and some other 20th-century musical composition techniques into his Dizi solo and concerto composing. Dizi is a major Chinese musical instrument, and also sometimes known as the di or hengdi, and has varieties including the qudi and bangdi. Traditionally, the dizi has been popular among the Chinese common people, and it is simple to make and easy to carry. Most Dizi are made of bamboo, which explains why Dizi are sometimes known by simple names such as Chinese bamboo flute. Players use their mouth to blow into the dizi and produce notes by covering or uncovering the holes with their fingers. The performing techniques including circular breathing, slides, popped notes, harmonics, “flying finger” trills, and double-tonguing and so on.